Paul McCartney was in the East Room at the White House this week to receive the Library of Congress Gershwin Prize for Popular Song from US President Barack Obama. It’s just the third time the award has been presented. 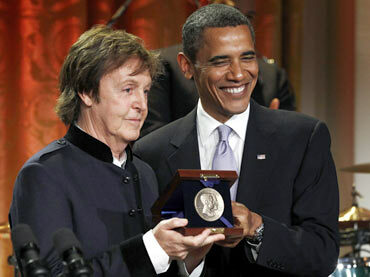 “It’s sure to be a pop culture reference point for years to come: Sir Paul McCartney performed for the Obamas at the White House on Wednesday in light of the Beatle being presented with the third annual Gershwin Prize for Popular Song. He followed in the formidable footsteps of Stevie Wonder and Paul Simon. (The concert and award speeches were taped by PBS and will be televised as a 90 minute TV special on July 28th in the US). This entry was posted in Beatles, Paul McCartney and tagged Beatles, Beatles Related, Gershwin Award, McCartney Obama, Paul McCartney by beatlesblogger. Bookmark the permalink.